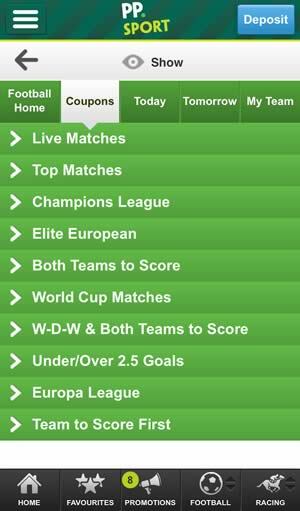 Paddy Power Mobile is the most used bookmaker app in the UK. Bet from your Samsung Galaxy, Google Nexus, Motorola, Sony etc. The best bookmaker for money back specials and free bets. 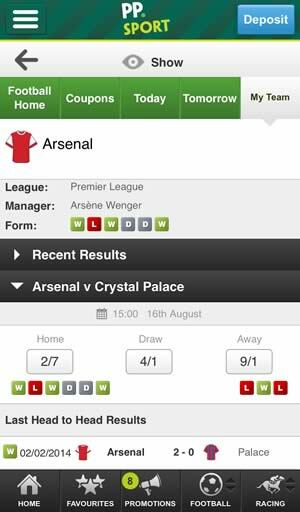 Set your favorite football team to receive tailored statistics and facts. The history of Paddy Power dates back to 1988, when the company was founded as a result of the merger of three respected Irish bookmakers: Stewart Kenny, David Power, and John Corcoran. Paddy Power’s unique brand of sports betting quickly gained a massive following due to unconventional wager and sincere commitment to offer greater value and fairness than the competition. ​In 2010, Paddy Power operated a total of 356 outlets in United Kingdom and Ireland and its turnover exceeded €3.83 billion, which was a 39% increase on 2009. 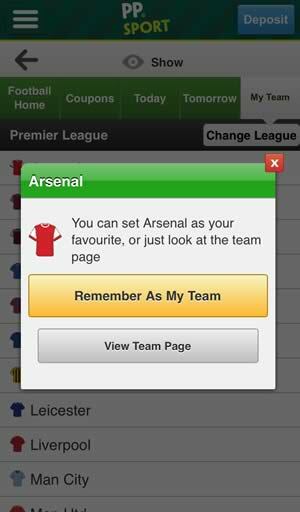 Unlike most other online sportsbooks, Paddy Power offers downloadable apps for iPhone, iPad and Android systems, which allow you to cut on the loading times by keeping all the necessary data on your mobile device. Nevertheless, if you prefer not to install any dedicated gambling apps, you can always go for the browser-based software, which is compatible with all the popular smartphones and tablets and which doesn’t require you to commit to a download. 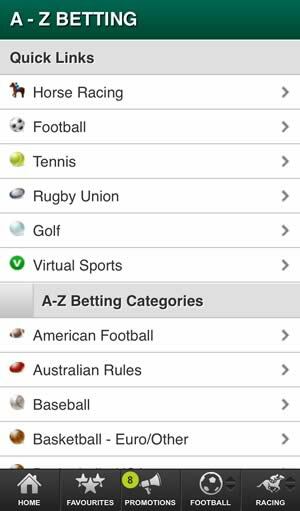 Regardless of the solution you use, you can rest assured that you’ll be able to take advantage of all the Paddy Power sports betting opportunities, as all the mobile apps are very similar to the desktop-optimized version of the site in terms of functionality. Risk Free 20: New customers only, limited to one per person. 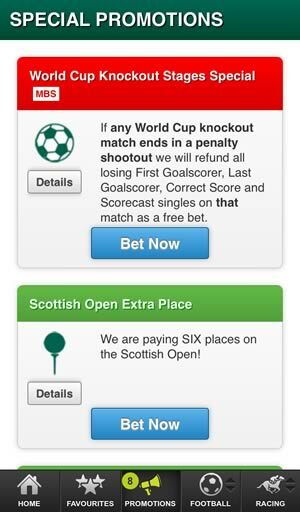 If you’ve previously had a Paddy Power account, you will not qualify for the offer. Place your FIRST bet on any Sportsbook market and if it loses we will refund your stake in CASH. Max refund for this offer is £20. Only deposits made using Cards or Paypal will qualify for this promotion. 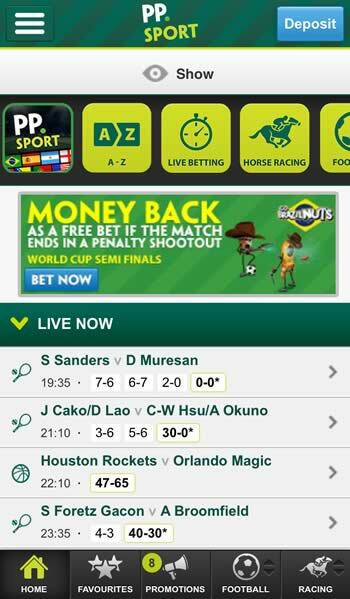 The pre-match sports betting section is the heart of all Paddy Power mobile apps. The site allows you to wager on all the popular European disciplines, including soccer, volleyball, tennis, handball, netball, snooker and motor racing. However, there’s nothing to stop you from putting your money on high-profile American events, as the number of NFL football, NBA basketball or MLB baseball markets is downright impressive for a site that doesn’t accept US-based customers. In addition, Paddy Power allows you to wager on mixed martial arts, virtual sports, politics, professional poker, business and even chess. The props offered on Paddy Power tend to get somewhat crazy and controversial from time to time. For example, Paddy Power was the only sports betting site to post the odds on the potential extinction of the polar bear or on an assassination of the US president. The prices offered by Paddy Power tend to be pretty amazing even when compared with the other major European sportsbooks, so you’ll never feel like you’re giving up on long-term profitability in exchange for access to gimmicky wagers. All things considered, Paddy Power offers a completely unique sports betting experience that can’t really be compared with any other site. While Paddy Power does not operate a separate racebook, there’s simply no denying the fact that the horse section is quite comprehensive, even for European standards. The site allows you to put your money on the outcome of daily horse races held at all the important tracks in United Kingdom, Ireland and France and has a separate section for American racing. The site allows you to bet on all the biggest National Hunt and Flat events in advance and offers plenty of specials, which include interesting props such as whether a particular stable will be the UK champion trainer in the upcoming season or whether a particular jockey will manage to win the championship or not. Finally, it is worth pointing out that Paddy Power customers are free to take advantage of all the daily UK Tote betting pools, which become available for wagering from 8am GMT. The greyhound racing section isn’t as impressive as the one dealing with horses, but you shouldn’t have any problems with wagering on the races held in the United Kingdom or finding interesting props. Both racing sections give you access to free betting tips, which should be quite useful for inexperienced bettors and horse racing enthusiasts. 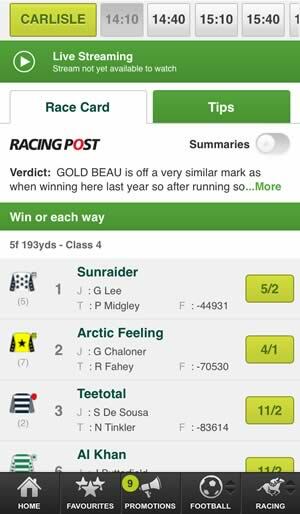 For more information on the PaddyPower horse racing section, check out our Paddy Power Racing App Review. Paddy Power is an amazing site when it comes to live in-play betting – the event coverage is nothing short of impressive and the number of available bet types and props should satisfy even the most demanding customers. One of the biggest advantages of choosing Paddy Power for live betting is the fact that the site allows you to wager on the outcome of numerous local events, which means that you won’t be restricted to betting on high-profile tournaments. Quite obviously, there’s nothing to stop you from betting on the 2014 World Cup or an NBA championship match – in fact, the odds and the quality of props are noticeably better for steam games. Paddy Power follows the latest trends by offering an exclusive live streaming video service that allows you to watch about 3,000 sporting events each year free of charge. However, you should keep in mind that this content can only be accessed by customers logging in from the Republic of Ireland due to licensing issues. Furthermore, you should keep in mind that the streaming service is available only with the desktop-optimized version of Paddy Power software. Consequently, you’ll have to switch to the full site view to enjoy the live streams regardless of the mobile app you picked.